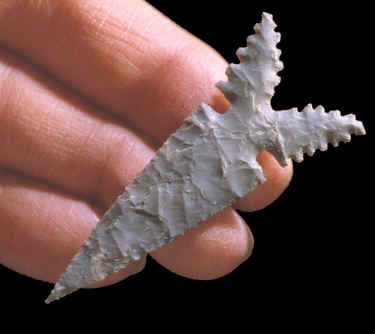 This Tribute point represents one of the most artistic and finely crafted arrow points ever found in North America. At least 21 other Tribute points, of varying sizes, were discovered in Craig mound. This example is one of the largest, thinnest and most symmetrical in the group and thought to be the best one in the cache. The excavation of Craig mound by commercial diggers in 1933 unearthed large numbers of arrow points. Estimates run as high as 10,000. 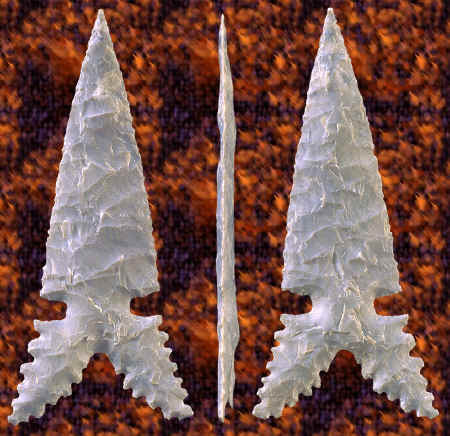 Craig mound produced approximately 24 different major point types plus many "artistic" subtypes. Comparisons have been made to Mound 72 at Cahokia where approximately 1200 arrow points were found which include at least 17 different types or sub-types. Some of them are similar to this point when compared to its style of serrations and fine craftsmanship. Tribute points date to the early Caddoan period sometime around A.D. 1100. All known examples are reported to have been found with a single burial in Craig mound. This Tribute point is made of blue-gray Boone flint and measures 2 5/16 inches long. This picture shows three more views of the Tribute point. People have been calling them Tribute points for several years. However, in 2002 Greg Perino describes this point but gives it a new name, calling it the Craig point after the mound where it was found. 2002, Perino, Gregory, "Selected Preforms, Points and Knives of the North American Indians," p. 58. 2004, Merriam, Larry G. and Merriam, Christopher J., "The Spiro Mound: A Photo Essay," "The Tribute Points Frame," pp. 100 & 101.